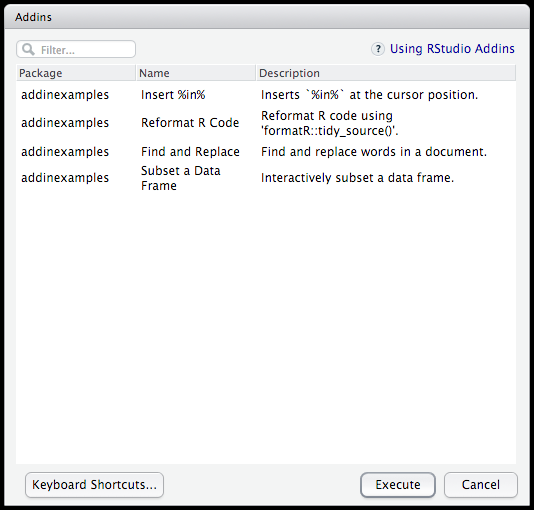 RStudio addins provide a mechanism for executing R functions interactively from within the RStudio IDE—either through keyboard shortcuts, or through the Addins menu. An addin can be as simple as a function that inserts a commonly used snippet of text, and as complex as a Shiny application that accepts input from the user, and later mutates a document open in RStudio. The sky is the limit! This guide will walk you through the basics of installing addins, binding keyboard shorcuts to them, and finally developing your own addins. RStudio Addins are distributed as R packages. Once you’ve installed an R package that contains addins, they’ll be immediately become available within RStudio. Try clicking the Insert %in% addin – you’ll see the text %in% inserted at the cursor position. Of course, it would be preferable to insert %in% through a keyboard shortcut rather than through clicking through a menu, so let’s learn how to bind this addin to a keyboard shortcut. First, click Browse Addins… to explore all of the addins currently available. At the bottom left of the dialog, you’ll see the Keyboard Shortcuts… button. Click this, and the Modify Keyboard Shortcuts widget will be opened, filtered to the current set of addins. 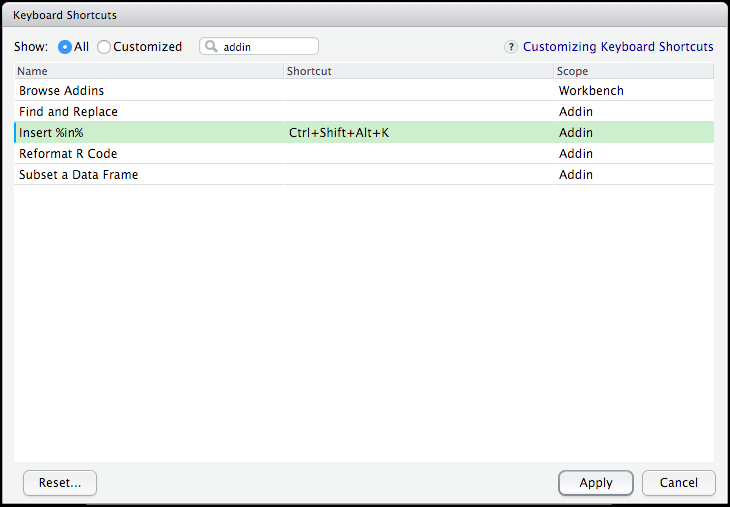 Let’s bind Insert %in% to Ctrl + Alt + Shift + K – click on the ‘Shortcut’ field for the ‘Insert In’ addin row, and type those keys. You’ve now bound this addin to a keyboard shortcut! Try typing Ctrl + Alt + Shift + K in the editor, and you’ll see %in% inserted at the cursor position. You can imagine generating a number of these addins yourself for other commonly used code snippets or operators. Try executing addinexamples::insertInAddin() directly at the console. You should also see %in% inserted immediately after executing the function. This is exactly what RStudio is doing behind the scenes; it’s just allowing you to execute that function through some UI rather than manually writing and executing the function yourself. Text macros, which insert text into the console or source pane and in some cases transform text within the source pane. The insertInAddin addin defined above is an example of a text macro. Shiny Gadgets, which are fully interactive Shiny applications. Gadgets may also perform text transformations but they of course capable of much more. More details on Shiny Gadgets are provided below, but first we’ll take a look at using the rstudioapi package (which allows us to interact with RStudio from R code) and then what it takes to install and register an addin. For addins in particular, a number of methods were added that allow R code to introspect and mutate the contents of a document open in RStudio. These methods are outlined below briefly, but see documentation within the rstudioapi package for more details. getActiveDocumentContext() Returns information about the currently active RStudio document. See below for more details. insertText(location, text, id = NULL) Insert text at a specific location within a document. setDocumentContext(text, id = NULL) Set the contents of a document open in RStudio. id — The unique document id. path — The path to the document on disk. contents — The contents of the document. selection — A list of selections. The id can be passed to other functions within the API to address a specific document instance rather than the currently active document. Even though it’s optional, it’s highly recommended that you use the id parameter to ensure that you modify the document that was active when your addin was invoked. The location argument to several of the API functions specifies a position or range to operate on. See the rstudioapi manual for more details on specifying locations. Name: The name of the addin. Description: A description of the addin. Binding: The R function this addin is associated with. Interactive: Whether this addin is interactive (e.g. runs a Shiny application). Description: Inserts `%in%` at the cursor position. RStudio will automatically discover and register these addins when your package is installed. Note that you can register as many addins as you like within a single addins.dcf file, just be sure to insert a blank line between each addin that is registered. Interactive addins are invoked by emitting a call to their function directly into the R console. For addins that display user-interface (e.g. using a Shiny application) this enables users to stop/interrupt them. Non-interactive addins are run in the background and can not be interrupted, so it’s imperative that these addins complete execution quickly. Otherwise, it’s possible that your addin could freeze the user’s R session. The use case for non-interactive addins is typically simple text insertion or transformation, in which case users would be annoyed if each invocation resulted in code being inserted into the console. Shiny Gadgets are similar to regular Shiny applications. You will need to develop a ui and a server for your gadget, and then use the runGadget() function to launch your gadget. ## Your UI items go here. If you’re unfamiliar with how the UI for a Shiny application can be generated, please check out Shiny UI Lesson to get further acquainted with how the UI for a Shiny application might be developed. ## Your reactive logic goes here. # contents of a document open in RStudio, using the `rstudioapi` package. # the gadget is closed after 'done' is clicked. paneViewer(): Launch your Shiny Gadget within the RStudio Viewer pane. This is useful for gadgets that want to run without obscuring other windows in the RStudio IDE, but such applications should require only a minimal amount of space (as the viewer may be small on the user’s computer). 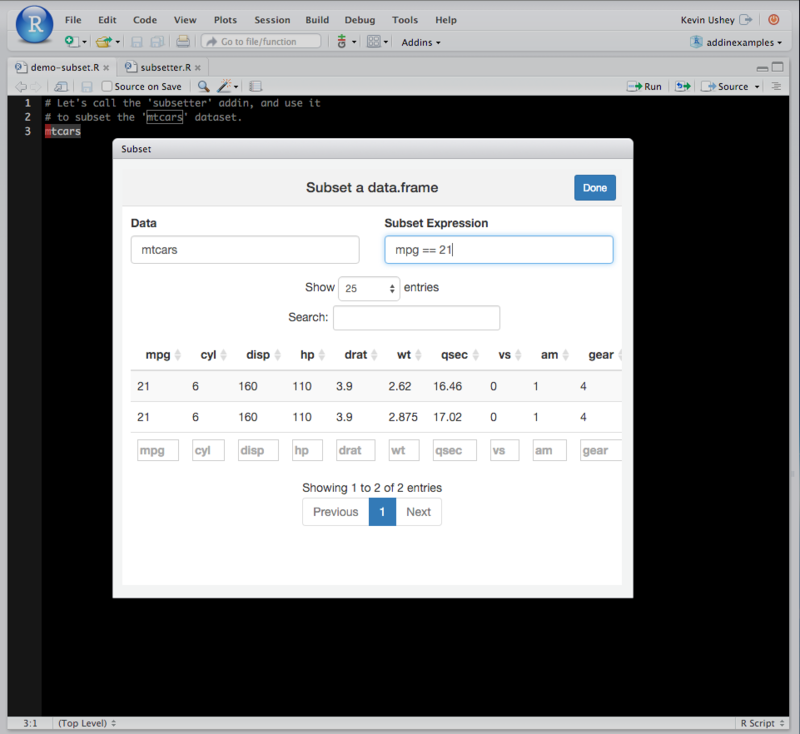 dialogViewer(): Launch your Shiny Gadget as a modal dialog within the RStudio IDE. Use this when your gadget requires a large amount of screen real estate, but is not heavy-weight enough to require a separate window. browserViewer(): Launch your Shiny gadget in a separate window. Use this for large Shiny gadgets that require a large amount of real estate, and perhaps are more complex than applications that could fit comfortably within an RStudio modal dialog. Let’s combine the above components into a simple ‘Hello Shiny’ gadget. We’ll create a clock that updates its display every second. Try running the following code in RStudio – you should see a clock displayed in the viewer pane. When you click Done, the current time will be inserted at the cursor position. # We'll wrap our Shiny Gadget in an addin. # Let's call it 'clockAddin()'. # simply displays the time in a 'UI' output. # Set some CSS styles for our clock. # to update and show the clock every second. # to ensure it's repeatedly fired. # Get the time, and render it as a large paragraph element. # insert the current time, and then stop the gadget. # 300px to ensure we get enough screen space to display the clock. # Try running the clock! # 'inst/rstudio/addins.dcf', and you're ready to go! Find and Replace — Find and replace words in a document. 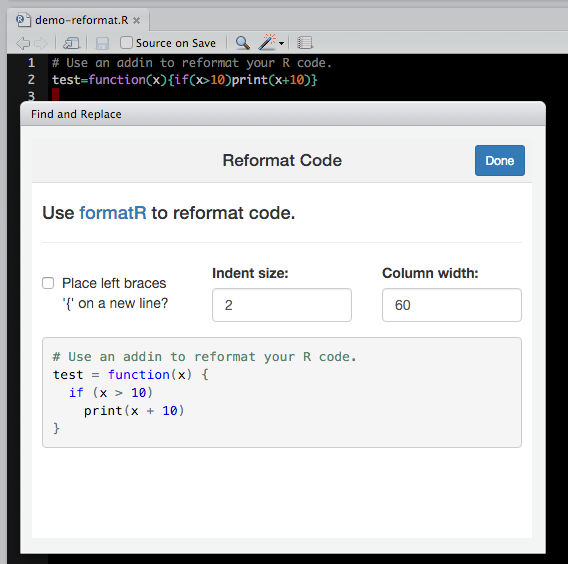 Reformat R Code — Reformat R code using formatR::tidy_source(). Subset a Data Frame — Interactively subset a data frame.